Something to make you think – a leader is…. Posted on February 25, 2013 Categories leadership, Leadership and ManagementTags Desmond Tutu, Jack Welch, John Chambers, leadership, Leadership and Management, Leadership is, Leadership Styles, what is leadership3 Comments on Something to make you think – a leader is…. Leadership:Simon Sinek: How great leaders inspire action! Here Simon Sinek presents a simple but powerful model for how leaders inspire action, starting with a golden circle and the question “Why?” His examples include Apple, Martin Luther King, and the Wright brothers — and as a counterpoint Tivo, which (until a recent court victory that tripled its stock price) appeared to be struggling. TEDTalks is a daily video podcast of the best talks and performances from the TED Conference, where the world’s leading thinkers and doers give the talk of their lives in 18 minutes. TED stands for Technology, Entertainment, Design, and TEDTalks cover these topics as well as science, business, development and the arts. Closed captions and translated subtitles in a variety of languages are now available on TED.com, athttp://www.ted.com/translate. Posted on February 11, 2013 Categories leadership, Leadership and ManagementTags inspiring leadership, leadership, Leadership and Management, Leadership Styles, Simon Sinek, Start With Why, The Golden Circle1 Comment on Leadership:Simon Sinek: How great leaders inspire action! The Three Levels of Leadership is a modern leadership model. It was introduced in a 2011 book, The Three Levels of Leadership: How to Develop Your Leadership Presence, Know-how and Skill, by James Scouller. You can find a link to it below. The model is designed as a practical tool for developing a person’s leadership presence, know-how and skill. It summarizes what leaders need to do, not only to bring leadership to their group or organization, but also to develop themselves as leaders. The Three Levels of Leadership model combines the strengths of older leadership theories; for example, traits, behavioral/styles, situational, functional models; while addressing their limitations. It offers a foundation for leaders who want to apply the philosophies of servant leadership and are committed to “authentic leadership”. It is often classified as an “Integrated Psychological” theory of leadership. And it is sometimes known as the 3P model of leadership (the three Ps standing for Public, Private and Personal leadership). The first two levels, public and private leadership, are “outer” or “behavioral” levels. Scouller distinguishes between the behaviors that are related to influencing two or more people at the same time, simultaneously. This is what he calls “public leadership” to distinguish it from the behavior needed to select and influence individuals one to one. Influencing people one to one he calls private leadership. He lists 34 distinct “public leadership” behaviors. The third level, personal leadership, is an “inner” level and concerns a person’s leadership presence, know-how, skills, beliefs, emotions and unconscious habits. “At its heart is the leader’s self-awareness, his progress toward self-mastery and technical competence, and his sense of connection with those around him. It’s the inner core, the source, of a leader’s outer leadership effectiveness.” (Scouller, 2011). He lists 14 “private leadership” behaviors. The idea is that if leaders want to be effective they must work on all three levels in parallel. Leading With Style – What Is Yours? Leadership style is the way that a leader provides vision and direction for a group; how that leader oversees plans and goes about motivating people. Before World War II, Kurt Lewin led a research project to identify different styles of leadership. He identified three major styles of leadership and blends of these have influenced leadership thinking ever since. Most modern analyses of leadership describe a blend of these three styles but the underlying themes remain the same. Good leaders use all three styles with the most appropriate dominating at any particular time, depending on the situation. For example, in a crisis, there is little room for discussion – clear orders, well given, can save lives. The time taken for participation or giving inexperienced people free reign could be dangerous. Most of us are drawn to one of three styles as the most comfortable for us to use. But each one has disadvantages if used on all occasions. Being told what to do all the time in an authoritative style is demeaning and demotivating. This style also means one brain finding solutions rather than having access to contributions from the group. A participative style gains more commitment; it raises motivation and morale. When using a participative style, the leader retains final responsibility for any decision made and “carries the can” if that decision is not the right one. But all the group can be engaged and contribute. Using a participative style shows confidence and it is a sign of strength. This is the style of leadership that most employees respect above all others. But, as I’ve suggested above, it isn’t appropriate in all circumstances; among other things, participation takes time. Using a delegative style means the leader leaves those led to make the decisions. Of course, the leader is still accountable for the decisions made. This style is used most often, and most constructively, with well established groups who are quite clear about their roles, as well as the task and they have full information. They are then able to determine what needs to be done and how to do it. The leader needs to have confidence in the group to use this style comfortably. And, the leader still needs to set priorities and ensure the risks associated with the task are properly managed. What style of leadership do you use and how do you ensure that your style is appropriate to the task? Why do you follow a leader? Why don’t you want to manage older workers? Posted on October 1, 2012 Categories leadership, Leadership stylesTags Authoratative Leadership, Authoritarian Leadership, Delegatative Leadership, Delegative leadership, free reign leadership, Kurt Lewin, leadership, Leadership Styles, Management, participative leadership, Paticipitative LeadershipLeave a comment on Leading With Style – What Is Yours? Effective leadership is an underlying theme throughout the teachings of the Dalai Lama. International managerial consultant Laurens van den Muyzenberg identified the business leadership undercurrent in the 1990s after he was hired to advise the Dalai Lama. 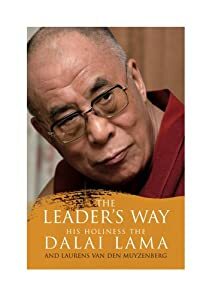 Realizing the great potential in combining their respective expertise, van den Muyzenberg and the Dalai Lama co-authored The Leader’s Way, applying Buddhism to business practices. Professor C.O. Herkströter, former CEO of Shell and Chairman of the Board of ING wrote this when reviewing the book. The approach represents the synthesis of East and West and provides an inspiring manifesto for business change. The first part of The Leader’s Way two-part message is this: in order to lead, you must understand the reasons for our actions then you can act to solve problems through integrity, respect and sensitivity toward others. For decades, Gallup scientists have researched the topic of leadership. They’ve surveyed a million work teams, conducted more than 50,000 in-depth interviews with leaders, and interviewed 20,000 followers to ask what they admired in the most important leader in their life. The results of that research are set out in the book, Strengths-Based Leadership. The most effective leaders are always investing in strengths. In the workplace, when an organization’s leadership fails to focus on individuals’ strengths, the odds of an employee being engaged are a dismal 1 in 11 (9%). But when an organization’s leadership focuses on the strengths of its employees, the odds soar to almost 3 in 4 (73%). When leaders focus on and invest in their employees’ strengths, the odds of each person being engaged goes up eightfold. The most effective leaders surround themselves with the right people and then maximize their team. While the best leaders are not well-rounded, the best teams are! Strong, cohesive teams have a representation of strengths in each of these four domains: executing, influencing, relationship building, and strategic thinking. The most effective leaders understand their followers’ needs. People follow leaders for very specific reasons. When asked, thousands of followers were able to describe exactly what they need from a leader with remarkable clarity. This was trust, compassion, stability, and hope. Tom Rath and Barry Conchie used firsthand accounts from highly successful leaders to show how each person’s unique talents can drive their success. The leaders included the founder of Teach for America and the president of The Ritz-Carlton. The second theme in this work is identifying the followers “Four Basic Needs”; Trust, Compassion, Stability and Hope which should inspire us all! If you would like to buy the book you can find it at this link. Troy Lum is founder and president of Wired2Lead and a proud graduate of Bellevue University’s Master of Arts in Leadership program. He works to develop leadership skills with businesses large and small. With support from his wife, he found the commitment, time, and cost of pursuing additional education opened new doors. At Bellevue University, he found a program that provided him with the tools and resources to work around his life. His post on Make it Happen Now provides 10 invlauable tips on how to develop your leadershhip skills. “Throughout my life, I have been inspiring individuals to become a voice in their community and create change. While I believed my leadership skills were well tuned, I am a lifelong learner and wanted to expand my knowledge on leadership development. My problem was that I was newly married, welcomed my son into the world and started a new job. No way was I going to have the time needed to go back to school. This is where my thinking all changed. I started to research graduate programs, learning toward an MBA because that is what I was told to get to work in the business community. While conducting my research on graduate schools and programs, I discovered a school in Nebraska named Bellevue University that had an interesting degree in Leadership. My degree opened my eyes to new and exciting leadership development skills. I took these skills and started my own organization working with individuals to develop strong leadership skills. My passion is to make positive change in the world by developing individuals to change their own community. Leadership Styles – the joys of participative leadership? Everyone loves participative leadership. Or do they? Usually, most of us would prefer to follow a leader who took our views into account. Most of us find it easier to commit to something if we have had an opportunity to have our say and to be involved in making important decisions that affect us. Generally, when a number of people contribute to a decision, that decision gains in quality and there is a better result. Let us imagine we are walking in a forest with a group of friends. Suddenly our little path comes out into clearing and there is a fork. The path on the left disappears off into the trees and so does the one on the right. Sadly, the map we’ve been following is out of date and we can’t even see a clearing. Which way do we go? It is getting dark. A chilly wind is getting up and all we want is to be at home again sitting in front of the fire with a warm drink. So we argue a bit and realise we are lost – we don’t know north from south. Then John, who hasn’t said much, reminds us that in the northern hemisphere moss grows more often on the north side of trees. We have lots of trees to check and there we are – we take the left fork. We’re on our way – home again in half an hour – just as the rain starts! Well, decisions in organizations can be like that! Sometimes, you, the leader, aren’t really sure you know the best way forward. You haven’t lost your way exactly but you’d like more information before you make that key decision. Your team would love the opportunity to contribute. If quiet John in the back office has enough confidence in you he might speak up! He might just know something you don’t about a new technology or the needs of a particular customer. That information could be invaluable. Without participative leadership, John would not have opened his mouth. And he certainly wouldn’t have committed to all those late nights working on that new technology to make it work for you and the team. Wendy Mason is a Life and Career Coach. She works with all kinds of people going through many different kinds of personal and career change. She offers coaching by phone and Skype as well as face to face, particularly for those wanting to increase their confidence. If you would like to know more you can contact Wendy at wendymason@confidencecoach.me or ring ++44 (0)2084610114. Her Skype ID is wendymason14. Posted on February 27, 2012 Categories leadership, Leadership stylesTags consultation, democratic leadership, Empowerment, joint decision making, leadership, leadership models, Leadership Styles, leadership theories, participative leadership, power sharing, Team Leadership1 Comment on Leadership Styles – the joys of participative leadership?